Richard (Rick) Nolan is a Democratic member of the United States House of Representatives, representing the 8th district of Minnesota. Nolan defeated incumbent Chip Cravaack (R) in the November 2012 election. Returning to Congress in 2013 after more than 32 years Nolan represents Minnesota’s sprawling 8th District – 18 counties that run from the top of the state’s Duluth/Lake Superior Arrowhead region, through some of the nation’s richest mining, timber, lakes and tourist country, to the fast-growing northern suburbs of Minneapolis-St. Paul. Rick Nolan grew up in Brainerd, Minnesota on the Cuyuna Range in the heart of the state’s lake country. His father, Hank, was a postal worker. His mother, Mary, was a homemaker who supplemented the family income in the area resort industry. A father of 4 and grandfather of 10, Rick has been married to Mary Nolan for 28 years. Nolan worked his way through the University of Minnesota as a proud Local 638 UPS Teamster, and later taught high school social studies in Royalton, Minnesota. He directed the North Central Minnesota 19-unit Head Start program and was curriculum coordinator for the Little Falls Adult Education program. He did post-graduate work at St. Cloud State University, Central Lakes College and the University of Maryland. Rick Nolan was endorsed by Our Revolution, an organization run by former campaign workers and supporters of former socialist presidential candidate Bernie Sanders. Rick Nolan is a Berniecrat, is a term used for those democrats (generally) running for office who have expressed support of former presidential candidate Bernie Sanders. He began his public service in 1968, representing Morrison County in the Minnesota House of Representatives for 2 terms. At 24, he was one of the youngest people ever to serve in the Minnesota Legislature. Rick Nolan was elected to Congress from Minnesota’s 6th District, which then encompassed 22 central and southwestern counties, in 1974, arriving in Washington as part of a record number of new Members at the onset of the post-Watergate era. Rick decided to leave Congress in 1980 to spend more time with his young family and pursue private business. In the ensuing years, he devoted much of his professional energy to generating Minnesota jobs through exports and trade. Establishing his own business, U.S. Export Corporation, he worked with then Minnesota Governor Rudy Perpich to build and operate the Minnesota World Trade Center in downtown St. Paul. He later served as president of the Minnesota World Trade Center Corporation and chaired the International Association of World Trade Centers’ Trade and Policy Committee, the world’s largest private sector international trade group. Rick is also the former owner of Emily Wood Products, a small sawmill and pallet factory in the northern Minnesota community of Emily. He successfully built the business and generated good jobs in the area. Continuing his public service, Rick became chairman of his local Mission Township Planning Committee, and chairman of the Central Lakes College Foundation, raising money for disadvantaged students of all ages. In 1977, Nolan and New York Rep. Frederick Richmond traveled to Cuba to secure the release of American prisoners. Nolan personally lobbied Fidel Castro and the two bonded over a shared love of fishing. 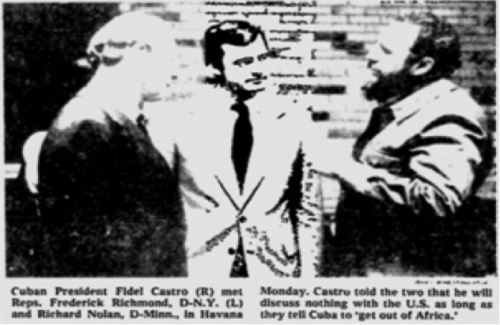 After agreeing to release the prisoners, Castro invited Nolan to return to Cuba for a fishing trip. 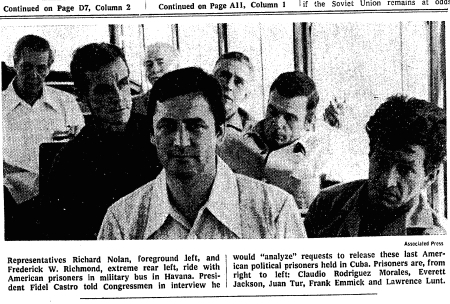 December 7, 1977, the New York Times printed this ​photo of Rick Nolan's trip to Cuba to negotiate with Fidel Castro for the release of five American political prisoners ​on the front page. For the last 30 years, a number of us have been calling for a resumption of U.S. diplomatic and trade relations with Cuba. Last week’s announcement that the U.S. will finally and fully re-engage with that island nation - just ninety miles from our shores - held special significance for many of us. I first traveled there as Member of Congress in 1977 to negotiate with Fidel Castro for the release of the last five American political prisoners still languishing for 17 years in a Cuban prison since the ill-fated Bay of Pigs invasion of 1961. During that trip in 1977, we were also able to negotiate a goodwill exchange program between the University of Minnesota and Havana schools of agriculture. It was viewed in many circles as an important step toward reconciliation between our two nations, thus moving us towards a normal diplomatic relations. Yet during the negotiation session that lasted through the night and into the next morning, after agreeing to the prisoner release, Castro predicted it would take another thirty years for the U.S. and Cuba to resume normal diplomatic relations. I thought him overly pessimistic at the time, but he proved to be correct. Next year, I hope to return to Cuba to meet again with top officials in Havana to discuss new trade opportunities that will lead to more good-paying jobs for Minnesota and for our region. Of course I will keep you posted on our plans. .
Several northeastern Minnesota labor leaders, including presidents of three major union organizations, called a press conference Thursday to announce that they are uniting behind one candidate seeking the DFL endorsement for 8th district congress: Rick Nolan An early endorsement from key labor leaders is rare in an 8th district race. Yet Duluth AFL-CIO Central Labor Body President Dan O’Neill, Carlton County Labor Body President Mike Kuitu, and Iron Range Labor Assembly President Tom Cvar called on all labor to join them in lining up behind the former 6th district congressman, referring to Nolan as a “champion for working people” who is the one candidate who can defeat Rep. Chip Cravaack and the Tea Party. O’Neill spoke to Nolan’s past experience as a three-term congressman, citing his staunch support of organized labor as well as his reputation as an effective leader. Nolan was one of 12 key progressives endorsed by 21st Century Democrats in the 2012 election cycle.Rick Nolan was one of 12 progressives endorsed by 21st Century Democrats in the 2016 election cycle. Rick Nolan represented Minnesota in Congress for eight years in the 1970s. Running on a platform of opposition to the Vietnam War, he was first elected in 1974, one of a wave of Democratic freshman seeking to reform the political system in the wake of the Watergate scandal. In Congress, Nolan was a passionate advocate of reforming U.S. foreign and defense policies. He worked to decrease the U.S. military footprint abroad, opposed aid to Nicaragua under the brutal Somoza regime and opposed clandestine efforts by the C.I.A. to prop up corrupt dictators in the name of opposing communism. Nolan retired from Congress in 1980 to pursue a successful career in the private sector. Disturbed by the divisive rhetoric of the Tea Party and other right wing conservatives, he has decided to reenter public service and is running for Congress in Minnesota’s 8th Congressional District. Rick Nolan was supported by Council for a Livable World again in 2016. Rick Nolan is a liberal’s liberal. He first won the House seat in 1974 on an anti-Vietnam war platform. He continues to oppose what he labels “wars of choice” that turn into tragic mistakes, such as our intervention in Iraq. He says it is time to extract U.S. troops from Afghanistan and has offered House floor amendments to cut back spending in Afghanistan. Rick strongly agrees that nuclear war is one of the most critical issues. Since returning to Congress, Rick has received a 100% and a 92% on the Council voting scorecard. November 29, 2012 Congressman-elect Rick Nolan appointed Mike Misterek, the campaign manager who led his successful drive back to the U.S. House of Representatives, to be his chief of staff. In his new role, Misterek will supervise overall operations in Nolan’s Washington, D.C. office, as well as District field offices. “Over the past 15 months I have come to know and deeply respect Mike for his extraordinary leadership skills as well as his dedication to the principles that guided our campaign to restore the middle class, solve problems and get things done. Now I look forward to working with him to assemble a team of capable, experienced and knowledgeable people to help me get things done in Washington,” Nolan said. Misterek is a founding partner in Twin Cities-based Strategic Field Concepts, LLC, where he managed advocacy campaigns focusing on Medicare, telecommunications, rural broadband expansion and voter outreach. He has worked on previous congressional campaigns and on the 2008 Obama for America campaign. He has also served as political director for the Minnesota Health & Housing Alliance and, early in his career, worked as a staff intern for U.S. Senator Paul Wellstone. Misterek is a 2003 graduate of the University of St. Thomas (Saint Paul, MN). In January 2013, former Minnesota State Rep. Tom Rukavina, who recently retired after 26 years in the legislature “because it was the right time to leave,” is getting back into politics. Minnesota Congressman Rick Nolan has hired fellow Democrat Rukavina to be one of his district liaisons. In January 2013, Rick Nolan was listed as a new member of the Congressional Progressive Caucus. In 2013 Progressive Democrats of America assigned activists to deliver their material to almost every US Congressman and several Senators. Ellen Sandbeck, was assigned as contact for Rep. Nolan. Signatories included Rep. Rick Nolan . In 2014 seven Minnesota Peace Project members from across the state went to Washington DC to meet with 9 out of 10 Minnesota members of Congress or their foreign policy aides. We explored our differences on key foreign policy issues such as military budget, nuclear disarmament, and support for ongoing negotiations on Iran’s nuclear program. The team had lengthy second meetings with both Senators’ staff. The CD8 Team met with Rep. Nolan in his Duluth office asking him to make a public statement supporting negotiations with Iran & calling for a cease-fire in Gaza.. The Alliance for Retired Americans Political Action Fund endorsed Rick Nolan in 2014, also 2012. Conservatives and Republicans in Minnesota objected to Democratic Rep. Rick Nolan putting on a fundraiser featuring an appearance by the Peter, Paul and Mary singer who pleaded guilty years ago to taking "immoral and indecent liberties" with a 14-year-old girl. Peter Yarrow pleaded guilty to the crime in 1970 and served three months in prison. President Jimmy Carter pardoned him in 1981. The event was scheduled to take place April 25 at Bowery Brothers Pub in Duluth, but was canceled by the Nolan campaign, after Yarrow's history was made public by Republican opponents. Nolan praised President Obama's announcement that the U.S. would re-establish diplomatic ties to Cuba. Nolan traveled to Cuba in 1977 during his first stint in Congress and was involved in a past deal to release U.S. prisoners held there. Nolan says he hopes to travel to Cuba in 2015 to meet with officials there. Representative Rick Nolan was part of President Barack Obama's March 2016 delegation to Cuba. Minnesota Rep. Rick Nolan’s been hearing the same question a lot these days: “How did you do that?” His campaign estimates that 58,000 voters in Minnesota’s 8th District split their ticket between him and Trump. That allowed Nolan to win the district by less than a point, while Trump won by an estimated 16 points. The Democratic-Farmer-Labor congressman spoke up at a November 2016 post election meeting about the economic anxiety many white, middle-class Americans are feeling for the first time and how that may have driven them from the party. Rick Nolan’s was the most expensive House race in the country in 206, attracting millions of dollars in outside spending. He doesn’t fault House Democratic leadership for this year’s failures in other districts. “It was at the top of the ticket,” he said. “To just run an anti-Trump campaign as opposed to, ‘Here we are, here’s our fix to these trade deals,’” Nolan said. Trade is an especially important issue in Nolan’s district, which is home to the mining region known as the Iron Range, and many of the working-class Rust-Belt regions in which Democrats underperformed. “I’m for trade, but not this free trade. It’s gotta be fair trade. And Trump seems to have gotten that. And the American people got that,” said Nolan, who backed Vermont Sen. Bernie Sanders in the Democratic primaries. He thinks Clinton’s about-face on the Trans-Pacific Partnership had a lasting impact. “People didn’t just fall off the turnip truck. They understood what was going on there,” he said. What Nolan did — pick and choose the parts of the national party message that resonated in his district — is what more candidates need to do, some members said . Rep. Rick Nolan, , center, talks with Mark Froemke, right, and Wayne Fleischhacker, of the AFL-CIO, during a fish fry and fundraiser at the Northland Arboretum in Baxter, Minn, October 2016. In August 2018 Medicare For All Congressional Caucus founding members included Representative Rick Nolan. This page was last modified on 25 February 2019, at 16:49.